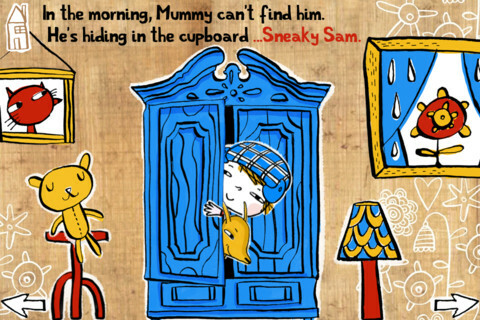 Meet Sneaky Sam, a little boy who’s ‘app’ to some mischief. I’m always on the lookout for e-books read in an Australian accent and it’s certainly the first thing I noticed about Sneaky Sam, an e-book designed for the iPhone and iPad. It’s the story of a little boy, Sam, who can be a bit cheeky and certainly very sneaky. He gets up to all sorts of tricks – some are mild such as turning his boiled egg shell over and pretending he hasn’t eaten it or planting fake spiders on unsuspecting friends. Some of Sam’s shenanigans are naughty – spraying Suki the cat with the hose and swapping school work with Cooper. The story ends sweetly with Sam pulling his final sneaky stunt – sneaking into bed with Mum and Dad for a cuddle. The story comes to life with nice touches and sound effects that are not distracting. For example, when Sam is hiding in a wardrobe, the creaky cupboard door opens and Sam peeks, giggling around the corner. On the same page, you can turn a lamp on, put the teddy to sleep and make Sam’s dog, Max, bark. There are certainly enough bells and whistles to keep kids aged two to five years entertained. Special mention must be made of the superb illustrations by Binny Talib. Set against a realistic wooden background, the characters have an appealing ‘Charlie & Lola’ feel – the flat, cartoonish drawings in a limited but eye-catching palette of gold, red, white and cobalt are a highlight. The app includes three games, the most impressive of which is ‘Stickers’ – a simple little ‘build-you-own-scene’ collection of illustrations used throughout the story. There are dozens of images in the ‘sticker’ collection and even the littlest of kids will quickly get in the swing of creating new scenes for Sneaky Sam. 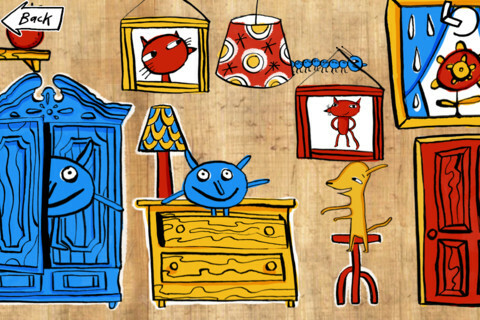 There’s also a simple matching pairs game with just four pairs and a very cute ‘Find Sam’ game which involves tapping all the furniture in Sam’s house to open and close drawers and cupboards until you find him. Lots of fun sound effects make this game a winner. Sneaky Sam is available via iTunes and costs $2.99.